AFC - 07/28/11 Justin Bieber in Croatia! Animal Friends and PETA announce: Justin Bieber in Croatia! Justin Bieber has an amazing period of life behind himself filled with chart-topping singles, concerts, major television appearances, a documentary about his life, and numerous awards. 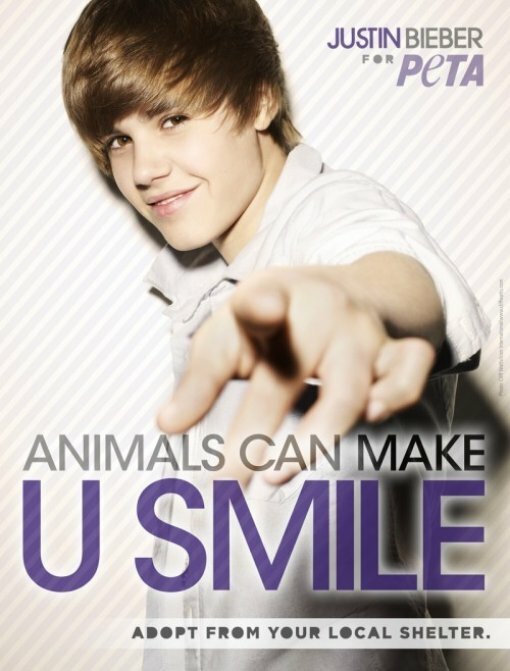 In spite of his busy schedule, Justin found time to star in his ad for PETA, encouraging people to adopt animals. Thanks to the long-time collaboration between Animal Friends and PETA, the world attraction Justin Bieber will appear with his ad "Animals Can Make You Smile" in Croatia too! Justin wants people to know that buying an animal takes a home away from a deserving dog waiting in a shelter for a loving family. "It's really important that people adopt," says Bieber in a statement. "I really encourage going out to an animal shelter or a place where you can get a dog who has been abandoned or doesn't have a home." Besides destroying a shelter dog's or cat's chance for a new life, buying an animal supports inhumane conditions in which animals are raised. In addition one should not forget that animals are not merchandise and shouldn't be used in commercial and trading activity. So if you are thinking about bringing an animal into your home, take a cue from Justin and give an animal at a shelter a new leash on life! This action is part of the "Family to the Seaside, Dog to the Street?" campaign conducted in collaboration with the City Department for Agriculture and Forestry of the City of Zagreb.